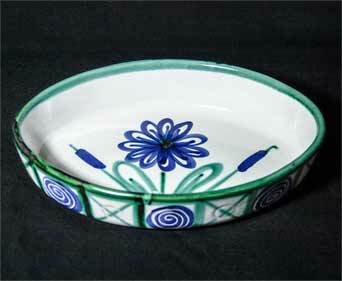 Picault oval dish - 9⅝" (244 mm) long, 7⅛" (180 mm) wide, 1⅞" (47 mm) high. Robert Picault was born in 1919 and after studying ceramics at the Ecole des Arts Appliqués in Paris moved, at the end of World War Two, to Vallauris where, with Roger Capron, he founded the Atelier Callis in 1946. Two years later he set up his own pottery in the Chemin du Fournas. He was a friend, colleague and next-door-neighbour to Pablo Picasso, and the two learnt from each other aspects of the other's specialities. Picault was also an accomplished cinematographer and photographer, and made a series of four short films with Picasso and leading show-business personalities of the fifties. He used copper oxide and iron oxide in his glazes, and the bulk of his work is characterised by green and brown motifs on a white background. Vallauris is a pottery region in south-eastern France, near Cannes. Pottery has been made there since ancient times. The area grew as a pottery centre in the late 19th century, and many companies have flourished there since then, notably those of Massier and Foucard-Jourdan. Modern Vallauris is lead-glazed earthenware, often highly coloured; the Mediterranean location sometimes showing its influence. Domestic tableware and cooking pots feature prominently.